Zend Framework is a Model-View-Controller framework. 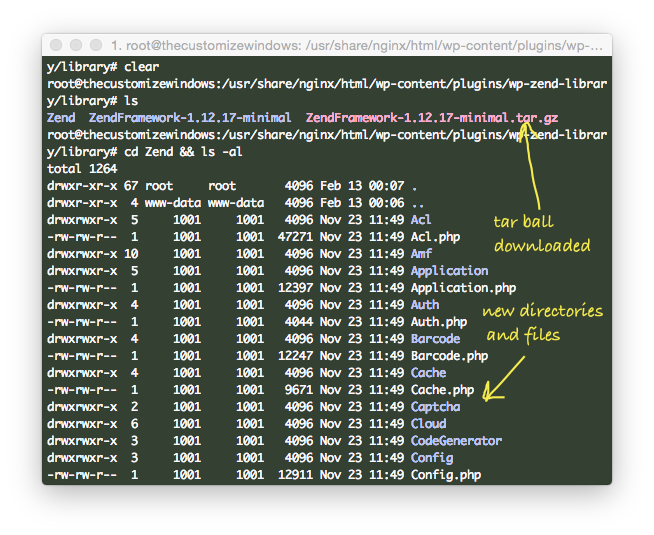 Here is How to add Zend Framework Lib on Existing Nginx PHP5-FPM WordPress using Plugin. This way the Zend Framework is utilized in a non MVC setup. This way is great when you want to create a non-WordPress PHP file or use your own custom theme or plugin created for Zend. Normally we install Nginx PHP5-FPM in this way to install WordPress. Migrating to Zend Server with Z-Ray from PHP5-FPM is not quite easy. This way gives most of the advantages of Zend Framework Library but backend remains untouched. Please understand that this implementation is not for the faint of heart. It requires additional coding. First install that plugin normally like other plugin. You can not activate it by default. There are steps. ssh to your server cd to the FTP root, like /usr/share/nginx/html. You should navigate to /wp-content/plugins/wp-zend-library/library/, that means the full path becoming /usr/share/nginx/html/wp-content/plugins/wp-zend-library/library/. That /usr/share/nginx/html is default FTP root of Nginx. wget https://packages.zendframework.com/releases/ZendFramework-1.12.17/ZendFramework-1.12.17-minimal.tar.gz tar -xzvf ZendFramework-1.12.17-minimal.tar.gz rm ZendFramework-1.12.17-minimal.tar.gz cd ZendFramework-1.12.17-minimal cd library && ls cd Zend && ls mv * ../../.. There will be lot of directories & files, like Acl, Acl.php, Amf, Application, Application.php etc. Now if you try to activate the wp-zend-library plugin from WordPress admin panel, it will easily get activated. This Article Has Been Shared 8191 Times! Cite this article as: Abhishek Ghosh, "Zend Framework Lib on Existing Nginx PHP5-FPM WordPress," in The Customize Windows, February 13, 2016, April 23, 2019, https://thecustomizewindows.com/2016/02/zend-framework-lib-on-existing-nginx-php5-fpm-wordpress/.